Amelia Bloomer, born Amelia Jenks in 1818, was a teacher, journalist, editor, fashion advocate, trendsetter and women's rights activist. Amelia married Dexter Bloomer in 1840. As the editor of the Seneca Falls County Courier. Dexter encouraged his wife to write for his newspaper, which Amelia did. In 1848, she attended the First Women's Rights Convention in Seneca Falls, NY. Amelia attended as an observer, but the following year she joined the movement. She started, The Lily, the first newspaper for women. The Lily began as a temperance newspaper but quickly expanded to cover women's issues. Amelia supported the suffrage movement as well as women's dress reform. Amelia strongly believed women needed to leave behind the restrictions of long skirts and corsets. She believed clothes should be functional as well as fashionable. In her newspaper, she said, "The costume of women should be suited to her wants and necessities. It should conduce at once to her health, comfort, and usefulness; and, while it should not fail also to conduce to her personal adornment, it should make that end of secondary importance." Throughout her career, Amelia fought for women and supported their efforts. She often found herself at odds with parts of the women's movement because she believed in temperance, but that never stopped her from supporting the core cause. In 1851, Amelia introduced her friend and frequent contributor to The Lily, Elizabeth Cady Stanton to Susan B. Anthony spurring a lasting partnership between these two activists. A statue stands in Seneca Falls, NY, commemorating this grand meeting. In the statue, as in real life, all three women wear the bloomer outfits popularized by Amelia. Even after selling her newspaper and moving to Iowa with her husband, Amelia continued her activism. She encouraged local women to become property owners, and during the Civil War, she set up a society to aid Union soldiers. 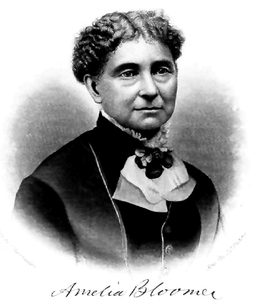 She also worked as the first president of the Iowa Woman Suffrage Association from 1871 to 1873. Amelia died in 1894 at the age of 76. She worked hard for and wrote about women's and social issues until the end. She lived long enough to see full and partial voting rights given to women in several states, but not quite long enough to witness the amendment to the Consitution. Her legacy lives on with the Amelia Booker Project, a booklist that honors feminist books for young readers. Learn about the "When Anthony Met Stanton" statue on Atlas Obscura. Check out the books listed on the Amelia Booker Project list.